I have a 10 month old baby bearded dragon, I used to have 4 older ones too, she came from one of my older ones so I have had her since she was born and have taken very good care of her, I’m not sure how big she should be, but she still looks very small. I’m very worried about her as I checked on her this morning and half of her head is a very greyish bubbly texture, It has never been like that before, and I know she isn’t shedding her skin. I’ve bathed and let her swim around in luke warm water in the bath for a little while to see if that would help, but it’s stayed the same. She hardly ever eats her food, I normally feed her cucumber with calcium sprinkled over it as a friend of the family breeds lizards and told me to do that, I keep her hydrated and take very good care of her too. She’s been lying under her log for weeks and hardly ever moves unless I pick her up to check she’s still alive. I live in the UK and it is very hard to find an experienced reptile vet, and it costs a lot of money too. Any idea’s on what it could be that is wrong with her? Do you have the proper UV lighting? What about the heat temps on the basking spot? Her diet should consist of dark leafy greens like dandelion greens and collard greens. Are you feeding her crickets or some other type of protien? She might not be able to digest her food. I just experienced an issue I had never run into. 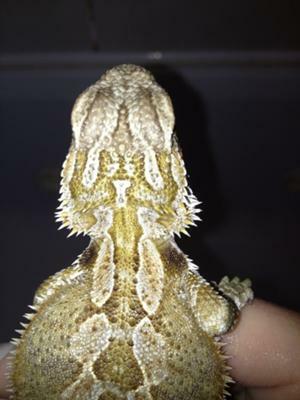 My dragon had no energy and would not eat, and sported a dark black beard. Come to find out that certain types of UVB bulbs don't last as long as their packaging says. This bulb lasted only 2 and a half months. I just bought a new bulb yesterday and he seems to be doing better. These UVB bulbs are deceiving because they still shine bright and yet they could be struggling to output the proper UVB. The symtoms of not having enough UVB are: not eating, lethargic or sleeps too much, and of course not pooping. There's always the option of buying a UVB meter (they're kinda expensive) or go with a better bulb, like the Mega Ray. My dragon did not have impaction -the vet examined him. It could very well be the UVB light not outputing correctly.